7 Comments on MSNBC. An online experience. 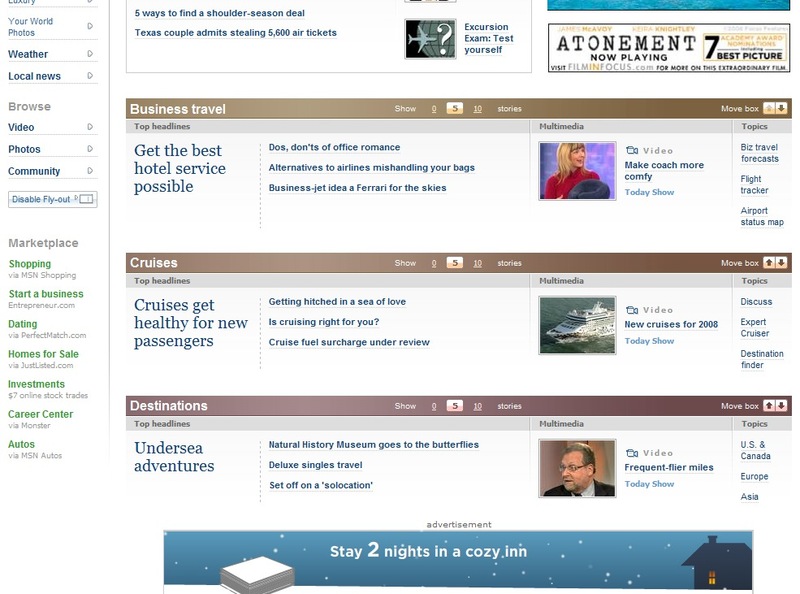 The primary and category homepages (e.g. Travel, Health, etc.) have simple, clean, and consistent layouts. They provide a minimalist feeling, making for easy skimming of the content. Within the sub-category sections of the pages the link color, mouse-overs, and gradients provide good contrast for eye-easy reading and highlighting. Customization and its impact on the elements on the page(s) is both obvious and easy to use. The category tree allows for the peeling away of the layers of the news-“onion”, gradually displaying more articles within the categories of interest, dynamically and without the need to load (or navigate to) additional web pages. The colors in the page header and footer make those regions of the page very hard to read and, in turn, use. The advertising displayed can be overly intrusive. 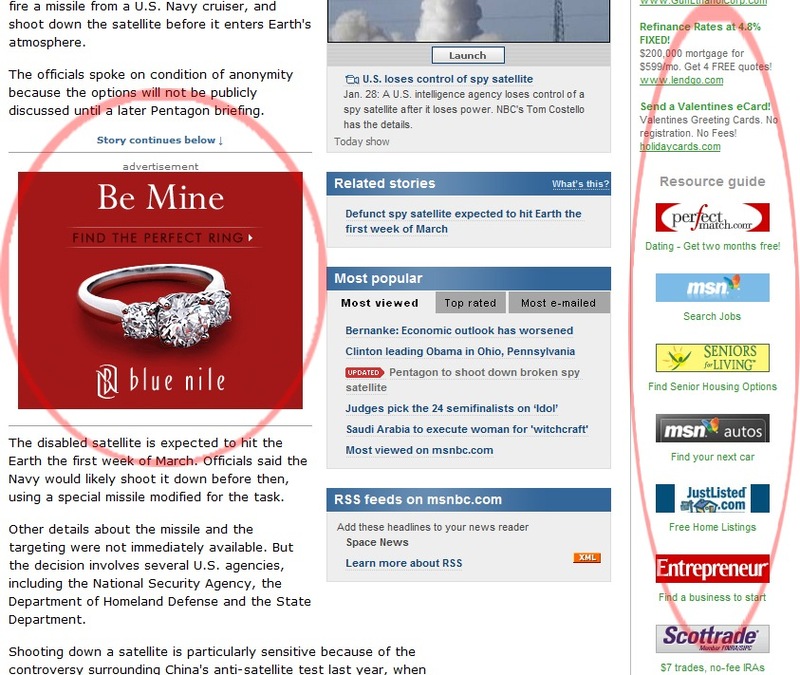 For example, the ads right in the middle of the text flow of the news articles are too much (and annoying). 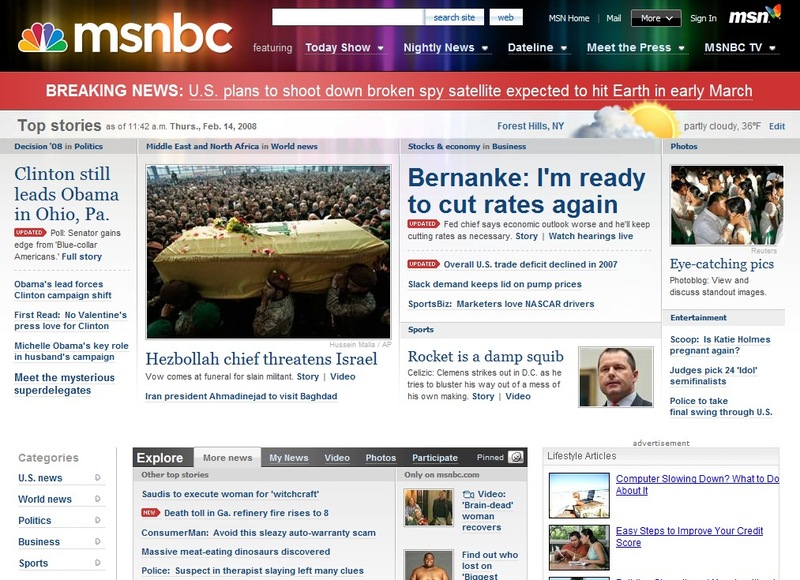 Don’t you (MSNBC) already have enough ads on the pages? Customizing the desired order of the sections on the page can be a slow and clumsy process. The placement and behavior (one move up or down at a time) are both contributing factors. 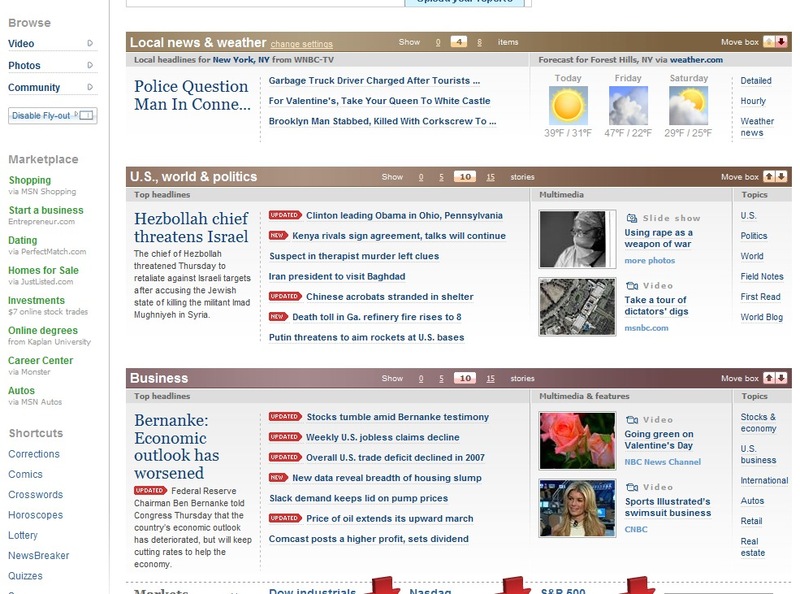 I’ve now explored, in detail, the top 3 online news experiences, Yahoo News, CNN, and MSNBC. Stay tuned to find out which one (or two?) stand out as the best online user experience. Subscribe now (click here) to make sure you don’t miss out on the conclusion of this series comparing and contrasting the top 3 online news sites (Yahoo News, CNN, and MSNBC) along with my declaration of online news experience champion. Tune in to see if you agree with me — or want to argue a different perspective. I rather think Fox News has twice the traffic of CNN, and at least sixteen times the traffic of MSNBC. Odd it is missing from your list, eh? As a matter of fact, March 2008 is the first time this year that Fox News has achieved any placement within the Top 10 online news rankings. Previous Entry CNN website. What’s so good about it?